Whilst the stereotypical vision of an African safari is viewing game from the comfort of an open roofed vehicle, there are plenty more ways to experience the continent’s wildlife. There’s no better way of really experiencing game and wildlife habitats than getting out on foot for a walking safari to see and track game. In fact for many people a walking safari is the ultimate safari experience as the experience of walking through the bush can be so intense and unique. As walking safaris become more popular, increasing numbers of game reserves and safari operators are expanding the type of walking safaris offered. Tanzania and Namibia lead the pack in combining fly-camping safaris with walking safaris – dropping you off in a remote location to camp and walk the surrounding wilderness with and experienced guide. For a combination of walking and canoe safari several operators now run these across camps in the Okavango Delta in Botswana, which offers the perfect terrain for combining water-based game viewing activities with a walking safari. Walking safaris for tourists date back to 1960’s Zambia, and the country is still home to some of the continent’s best walking safari experiences. South Luangwa National Park presents opportunities to spot buffalo, leopard, elephant and hippos, with specialities of Cookson’s Wildebeest and Thornicroft’s giraffe. Or if you want to take it a step further, the camps in neighbouring North Luangwa offer only on-foot safaris! Kruger National Park in South Africa is famous across the region for the quality of walking safaris on offer, and is big five country. There’s a fair chance you won’t see any of the big five whilst on foot – in fact you’d probably rather not see any of them too close up – but discovering small animals and insects and interacting with the terrain with a knowledgeable guide is a memorable experience. Many of the luxury camps in private reserves in Botswana’s Okavango Delta specialise in walking safaris as a break from the standard jeep and moroko safaris. The area is home to more than 200 species of water birds, large herds of elephants and plenty of big cats, as well as plenty of other small mammals. Southern Tanzania’s Selous Game Reserve is one of Africa’s largest national parks and offers a range of fantastic walking safaris. One type of walking safari is the “walking mobile” trip, where small groups of guests camp out under the stars at simple fly camps, with tents simple cubes of netting giving 360 degree views of the bush. Tok Tokkie Trails in Namibia is a walking safari with a difference – through a desert. The three-day, two-night trail follows a circular route through the private NamibRand Nature Reserve, complete with rugged mountains, gravel plains and towering red sand dunes. Always go with an experienced guide. 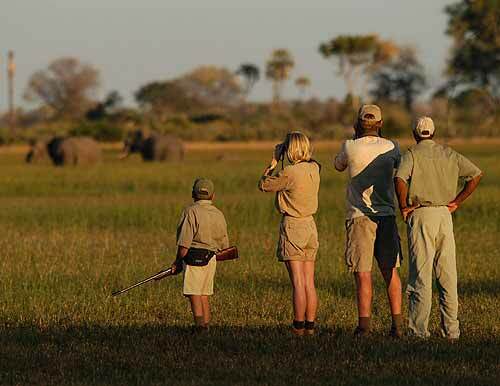 Walking safaris is where an expert guide really comes into their own – as a rule guides are totally familiar with the areas in which they operate, and have both formal training and experience with game found in the locale. Be sure to have proper safari clothing – including long sleeved shirts and trousers in light breathable fabric. Comfortable walking shoes, a wide brimmed hat, sun glasses and sun screen are also recommended to give you maximum protection. Read more on what to wear on safari.